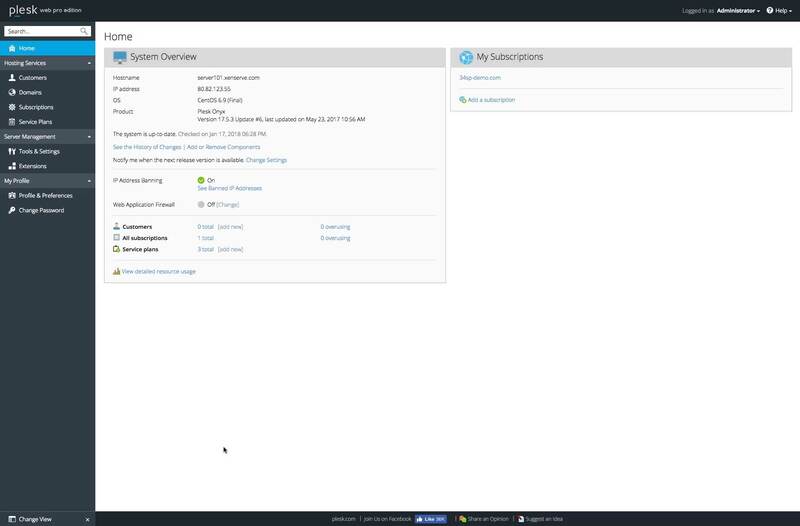 Manage your server's CPU, RAM and disk space on a site-to-site basis. Rebrand the Plesk UI to your needs, with your brand's own logo and colour scheme. Migrate from CPanel, Confixx or DirectAdmin without command line knowledge. Scan, repair, report, fix, migrate and transfer databases with ease. Fully featured e-mail with Horde or Roundcube webmail, POP & SMTP. Command line access gives you, your team or your client's full control. Install, stage, clone, sync, migrate and mass-update your WordPress sites easily with Plesk's WordPress Toolkit. With Plesk's Joomla! Toolkit you can install, secure, update, manage and monitor your Joomla! sites from one simple interface. Manage your websites and services wherever you are with Plesk Mobile Manager, a free app for both iPhone and Android. With an intuitive touch-friendly interface, Plesk Mobile Manager gives you all the power of Plesk on a mobile or tablet device. With Plesk, you can easily manage teams of all sizes. With the ability to set permissions for individual users, developers, designs and content managers can seamlessly collaborate across multiple projects. You can also create customer accounts so that external administrators can manage their own services, should you wish to. Reseller Hosting includes a service level agreement, guaranteeing 99.99% availability of your server.